These prices are effective as of March 15th, 2019, but are subject to change without notice. The goods and services shown below are those we can provide to our families. You may choose only the items you desire. However, any arrangements you select will include a charge for our basic services. If legal or other requirements mean you must buy items you specifically did not ask for, we will explain the reason inwriting on the statement we provide describing the funeral goods and services you selected. Thisfee includes: Staff Available 24 hours a day, 7 days a week to Respond to the InitialCall; The Arrangement Conference; Necessary coordination/consulting with the Cemetery,Crematory, Airline, & other parties involved with the final dispositionof the Deceased; Preparation/filing of necessary paperwork required for the finaldisposition of the Deceased; On-line, In-person, & Phone/Fax Accessibilityfor ease of processing selected Arrangements; Reasonable share of overheadcosts, including general facility maintenance, liability insurance, &governmental compliance costs. Except in certain special cases, embalming is not required by law. Embalming may be necessary, however, if you select certain funeral arrangements, such as a funeral with viewing. If you do not want embalming, you usually have the right to choose an arrangement, that does not require you to pay for it, such as Direct cremation or immediate burial, which includes Refrigeration in lieu of Embalming. Includes necessary equipment & coordination/scheduling,placement of Deceased, staff to receive/ transport(<15-miles)/displaymemorabilia, stationery, &/or flowers, & to supervise/assist with theviewing at a partner facility during regular business hours. Includes necessary equipment & coordination/scheduling, transfer & placement of Deceased, staff to receive/transport(<15-miles)/display memorabilia,stationery, &/or flowers, & to attend/assist with the viewing at asuitable location during regular business hours. Includes necessary equipment & coordination/scheduling, placement of Deceased, staff to receive/transport(<15-miles)/displaymemorabilia & flowers, & to supervise/assist with the funeral at a partneringfacility during regular business hours. Includesnecessary equipment & coordination/scheduling, transfer & placement of Deceased,staff to receive/ transport(<15-miles)/ display memorabilia & flowers,& to attend/assist with the funeral at any suitable location during regularbusiness hours. Includes necessary equipment &coordination/scheduling, staff to supervise/assist with service, set-up, & clean-up,& to receive/ transport(<15-miles)/display urn(s), memorabilia,stationery, & flowers at a partnering facility during regularbusiness hours. Includes necessary equipment & coordination/scheduling,staff to attend/assist with service, set-up, & clean-up, & to receive/transport(<15-miles)/displayurn(s), memorabilia, stationery, & flowers at any suitable location duringregular business hours. Includes necessary equipment & coordination/scheduling,transfer & placement of encased remains at graveside or Cryptside, staff toreceive/transport(<15-miles)/display memorabilia, stationery, &flowers, & to attend/assist with the Graveside or Cryptside service at any Cemetery,Memorial Park, or Mausoleum during regular business hours. *Base price is as-shown & dependent on availability; additionalcharges may apply depending on your location selection, if the location is outsideof the 30-mile radius, & separate Cemetery, Memorial Park, or Mausoleum arrangements.Clergy Honorarium, Stationery, & Flowers are not included, and can be purchasedseparately. The foregoing services, referred to as “Direct Cremation”, “Immediate Burial/Entombment”, “Aqua Cremation”, “Forwarding of Remains to Another Funeral Home", and “Receiving of Remains from Another Funeral Home”, are our Minimal Service Offerings which are provided at a reduced cost as they do not include any viewing/wake, service/ceremony, or special care or preparation of the body, beyond what is required for final disposition. Includesour Basic Service Fee, Crematory Fee, Local Transfer of Remains, Refrigeration/Shelterof Remains, a Temporary Plastic Urn, an Online Memorial, & a Courier to RetrieveCertified Death Certificate(s) from the Vital Statistics Office. If you want to arrange a Direct Cremation, you can use an Alternative Container. Alternative Containers encase the body and can be made of materials like fiberboard or composition materials (with or without an outside covering). The containers we provide are Shrouds, Alternative Containers, and other Cremation Caskets and Coffins, such containers are made of wood, corrugated fiberboard, or other composite and/or cloth materials. Includes our Basic Service Fee, Transfer of the deceased from place of death to the funeral home & to the Cemetery, Memorial Park, or Mausoleum, Refrigeration/Shelter of Remains, & Dressing/Casketing/Cosmetology, an Online Memorial, &a Courier to Retrieve Certified Death Certificate(s) from the Vital StatisticsOffice. Includes our Basic ServiceFee, Crematory Fee, Transfer from place of death to Portland, Refrigeration/Shelterof Remains, a Temporary Plastic Urn, an Online Memorial, & a Courier toretrieve Certified Death Certificate(s) from the Vital Statistics Office. AquaCremation, formally known as Alkaline Hydrolysis, may also be referred to as Aquamation, Dissolution, WaterCremation, Flameless Cremation, or Green Cremation, is a moreenvironmentally-friendly & flameless alternative to traditional cremationbecause there are no direct emissions of harmful greenhouse gasses or mercuryinto the atmosphere. Compared to traditional flame cremation, Aqua Cremation isvery energy efficient; offering an energy savings of up to 90%, with 1/10th ofthe carbon footprint. The nearest location offering this alternative method of finaldisposition is at our partnering facility in Portland, Oregon. *No Shroud/Container/Casket/Coffin fees apply as they cannot be used during the Aqua Cremation process. Includes our Basic Service Fee, Transfer of the Deceased to the funeral home, Embalming, Use of Our Facilities & Staff to prepare deceased for shipment within the continental U.S., & transfer to local Airport or other place of shipment within a 30-mile radius. Includes our Basic Service Fee, Shelter of Deceased, Transfer of the Deceased from local Airport or other place of shipment, & transfer to the Cemetery, Crematory, or Mausoleum within a 30-mile radius. *An additional $150.00 maybe added for deceased who have had an autopsy or tissue donation. This charge DOESNOT include any formal viewing/visitation/service/ceremony, any permanent urn,alternative container, casket, or shroud that is required by our Crematory, or applicablesales tax, transportation or mileage costs ($3.95/mile > 30-mile radius). Theforegoing services, referred to as our “Common Cremation Plans” & “Common BurialPlans” are helpful extensions of our Minimal Service Offerings. These plans werecreated to provide the utmost clarity, flexibility, and affordability bycombining our Direct Cremation & Immediate Burial Minimal Service Offeringsservices with their most common service-based additions at-cost or at similarlydiscounted rates. Please, note:None of our plans include any recommended Alternative Containers, Caskets, Coffins,Shrouds, or Urns used for Cremation, Burial, or Entombment, that may be requiredfor the chosen method of final disposition as required by our Crematory, or yourselected Cemetery, Memorial Park, or Mausoleum, as we know how sensitive &personal these selections can often be, & therefore believe it should be selectedseparately. To see our selection of Urns, Caskets, Alternative Containers,& Shrouds, please refer to our Casket Price List & Urn Price List. This plan includes Section I of our Direct Cremation Minimal Service Offering, with the added Use of our Facilities & Staff for a private or public witnessed cremation (unembalmed remains of the Deceased present, but not viewable) at our Crematory in Kent, WA during our regular business hours. This is NOT a formalfuneral service, which means that there will be no additional coordination, no seating,no funeral escorts, & is subject to the Crematory’s schedule. Expedited Direct Cremation (Upon Receipt of Cause of Death)-$850.00* This plan includes Section I of our Direct Cremation Minimal Service Offering, with added, expedited services for an up to 4-day return of Cremated Remains upon receipt of completion/submittal of required paperwork for cremation in addition to the accurate completion/submittal of the Cause of Death by the certifying physician/medical examiner. Thisplan includes Section I of our Direct Cremation Minimal Service Offering, withadded Minimal Preparation of Remains, placement of Deceased on a dressing tableor cot, & Equipment & Staff for a family-only Identification Procedurefor up to 1 hour at a partnering facility or other suitable facility/residence duringregular business hours. *Anadditional $150.00 may be added for deceased who have had an autopsy or tissuedonation. 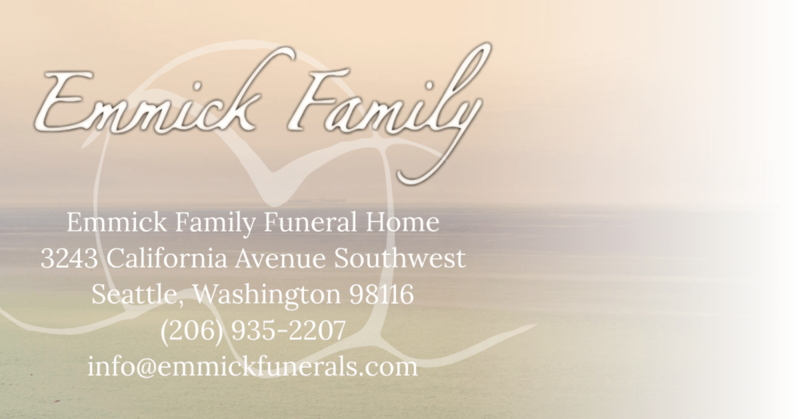 This charge DOES NOT include any public viewing/visitation/service/ceremony,any permanent urn, any alternative container, casket, or shroud that isrequired by our Crematory, applicable tax, or transportation or mileage costs ($3.95/mile> 30-mile radius). Thisplan includes Section I of our Immediate Burial Minimal Service Offering, withadded, expedited services for an up to 4-day burial of encased remains upon receiptof selected or purchaser-provided, compliant container, casket, or shroud, completion/submittalof the Cause of Death Section of the Electronic Death Certificate by thecertifying Physician/Medical Examiner, &/or any applicable autopsy or dispositionreview by a Medical Examiner. Thisplan includes Section I of our Immediate Burial Minimal Service Offering, withadded Minimal Preparation of Remains, & the placement of Deceased on adressing table or cot, & Equipment/Staff for a family-only IdentificationProcedure for up to 1 hour at a partnering facility or other suitable facility/residenceduring regular business hours. Thisplan includes Section I of our Immediate Burial Minimal Service Offering, with theadded use of our Hearse/Funeral Coach, necessary equipment & coordination/scheduling,transfer & placement of encased remains at Graveside or Cryptside, staff toreceive/transport(<15-miles)/display memorabilia, flowers, &stationery, & to supervise/attend/assist with the Graveside or Cryptside serviceat any Cemetery, Memorial Park, or Mausoleum during regular business hours. *An additional $150.00 may be added for deceased who have hadan autopsy or tissue donation. This charge DOES NOT include any public viewing/visitation/service/ceremony,any permanent urn, any alternative container, casket, or shroud that isrequired by our Crematory, applicable tax, or transportation or mileage costs ($3.95/mile> 30-mile radius). Terms of Payment: Check or Cash is Preferred. Due to the high cost of online andin-person debit/credit card transaction fees for Small Businesses like ours, a 3%online or in-person processing fee, or a 5% manual or phone processing fee willbe added to the total balance due for each payment made by debit or credit card. A printed version of this price list may be acquired at the Funeral Home. We are a very small business, and therefore recommend calling us to schedule an appointment to make advanced arrangements, or if you are in immediate need of our services. Above all else, thank you for your trust.